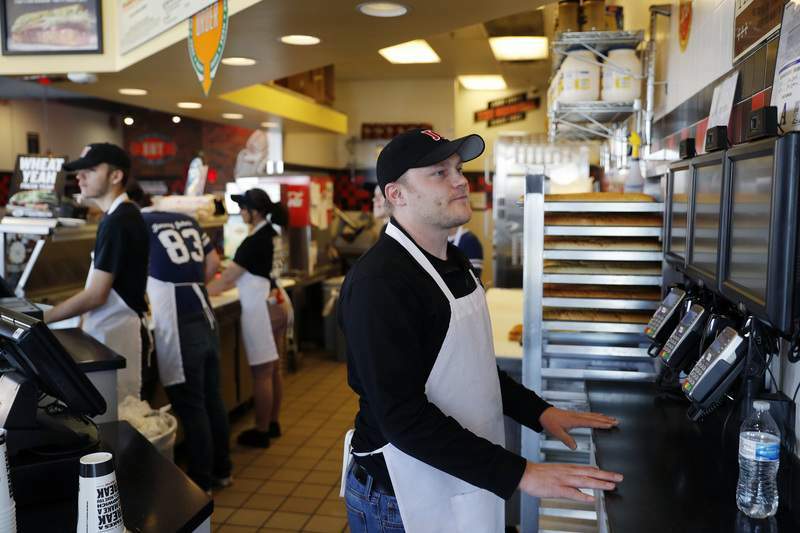 Associated Press Tyler Schwecke, a delivery driver for Jimmy John's, looks at monitors with lists of deliveries at a Jimmy John's in Las Vegas. Jimmy John's continues to employ its own delivery drivers. Who delivers the take out? Food delivery services such as Uber Eats and Grubhub are taking off like a rocket. But some restaurants aren't on board. Last week, Jimmy John's sandwich chain launched a national ad campaign promising never to use third-party delivery. Jimmy John's says its own drivers – which number around 45,000 at its 2,800 U.S. restaurants – can best ensure fast, quality service. “We just don't trust anybody else to deliver our product,” Jimmy John's President and CEO James North told The Associated Press. Jimmy John's is swimming against the tide – for now, at least. Starbucks is expanding delivery to more U.S. stores through its partnership with Uber Eats. Taco Bell said Thursday it will offer delivery nationwide through Grubhub. Third parties can also take longer. Boston Consulting Group found that four of the most popular services – Uber Eats, Grubhub, Postmates and DoorDash – averaged 49 minutes to deliver an order. Liz Meyerdirk, Uber Eats' head of global business development, says Uber Eats averages 31 minutes. Jimmy John's average is less than 20 minutes, partly because it limits delivery to a small radius. The company trains its drivers and gives them uniforms, North said. Pay varies by location. Jimmy John's charges customers around $2 for deliveries – some third parties charge $8 or more – and makes that work economically by doing more deliveries per hour. The growth of third-party delivery indicates customers will put up with some hiccups for the convenience and variety they provide. On Thursday, Grubhub reported $5.1 billion in food sales in 2018, a 34 percent increase from the prior year, and said it has grown to 17.7 million diners. Uber Eats said it expects to deliver $10 billion worth of food in 36 countries this year, up from $6 billion in 2018. “We're all trying to figure out how to serve that customer,” she said. Farm Burger, an Atlanta-based burger chain with 12 locations, has limited marketing resources, so it's grateful for the business that delivery services bring in. After DoorDash featured the chain in a promotion, it saw an all-time monthly high of 2,942 orders, says Dawn Law, the chain's marketing director. Even McDonald's says 70 percent of the orders it gets through its partnership with Uber Eats are customers it might not have gotten otherwise. “They may use third parties today because they want the demand, but in the long run they don't want to be dependent on them,” Bolden said.